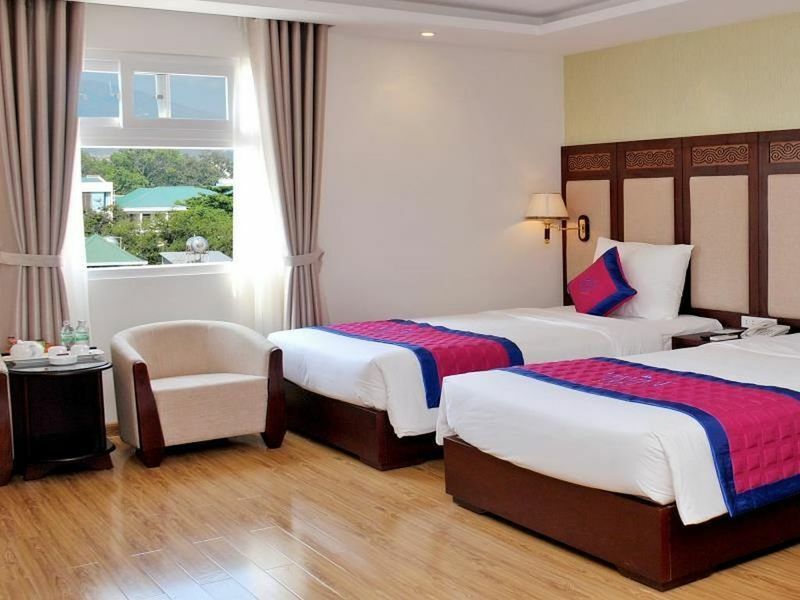 Heeft u een vraag voor Galliot Hotel Nha Trang? 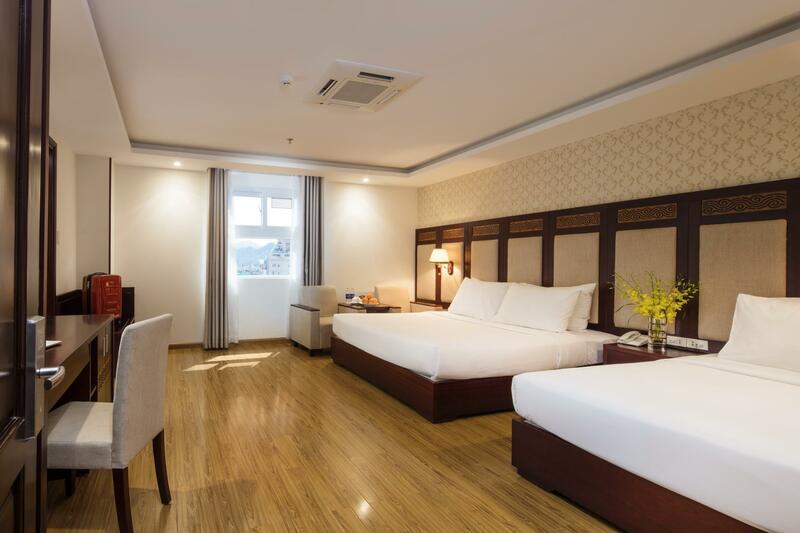 Als u zoekt naar een gunstig gelegen accommodatie in Nha Trang, zoek dan niet verder, Galliot Hotel Nha Trang is wat u zoekt. Gelegen op 0.1 Km van het hart van de stad, bevindt deze 4-sterren accommodatie zich op een excellente locatie, met de grootste attracties binnen handbereik. Dankzij de praktische ligging, biedt de accommodatie eenvoudig toegang tot alle belangrijke trekpleisters van de stad. 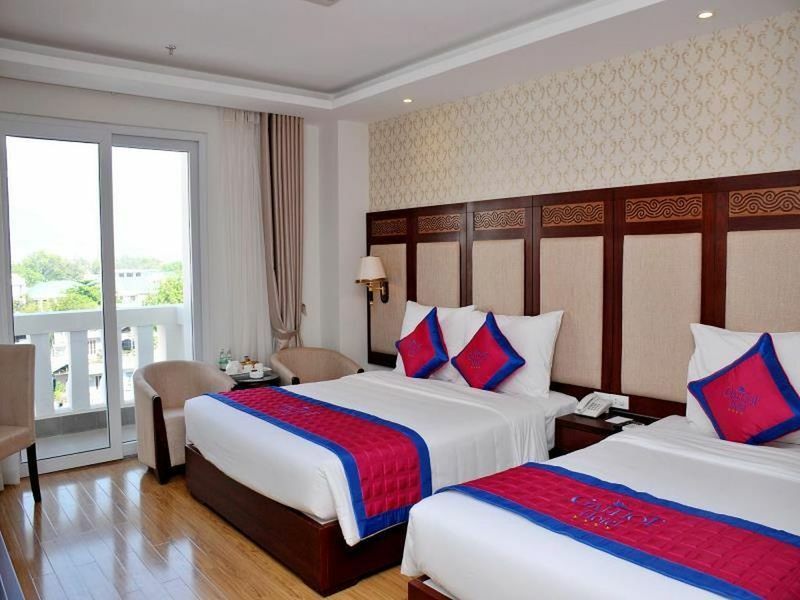 Profiteer van de ongeëvenaarde services en voorzieningen bij deze accommodatie in Nha Trang. Voorzieningen zoals 24-uur roomservice, gratis wi-fi in alle kamers, 24-uur beveiliging, dagelijkse schoonmaak, privé incheck/uitcheck zijn direct beschikbaar voor het gemak van iedere gast. Galliot Hotel Nha Trang beschikt over 135 gastenkamers. Deze zijn allemaal smaakvol ingericht voor optimaal comfort, met voorzieningen zoals plasma tv, kledingrek, oploskoffie, thee, gratis welkomstdrankje. De beschikbare recreatiemogelijkheden in de accommodatie zijn inclusief fitnesscentrum, zwembad (buiten), wellnessfaciliteiten, massage. 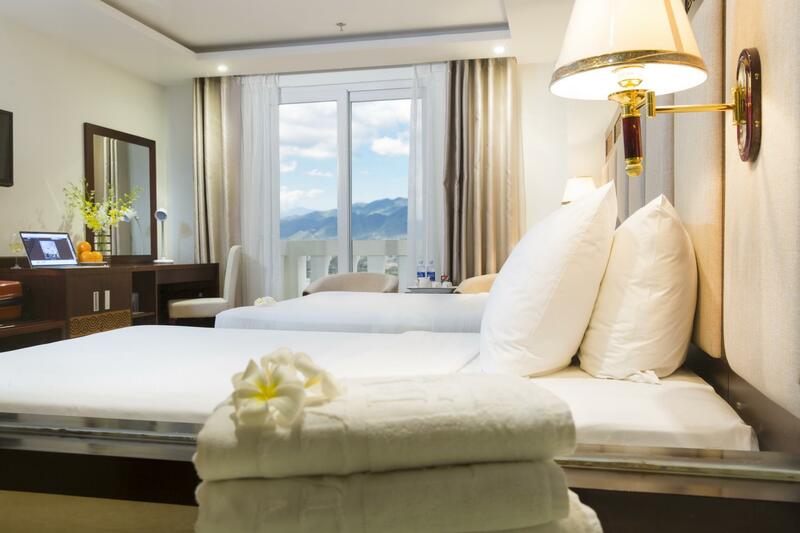 Ontdek een boeiende mix van professionele service en een breed scala aan voorzieningen in Galliot Hotel Nha Trang. Het maximum aantal kinderen dat per kamer is toegestaan is 2. Voor elk additioneel kind geldt een extra toeslag. Kinderen jonger dan 5 jaar verblijven gratis indien ze gebruikmaken van reeds aanwezige bedden. Het ontbijt van kinderen van 5 tot 11 jaar oud die reeds aanwezige bedden gebruiken, wordt bij het inchecken door de accommodatie in rekening gebracht. Gasten vanaf 12 jaar oud worden als volwassenen aangemerkt. Het hotel ligt centraal. Je kunt er direct in de buurt eten, excursies boeken en naar het strand. De douche was geweldig. Het zwembad op het dak was ook lekker. 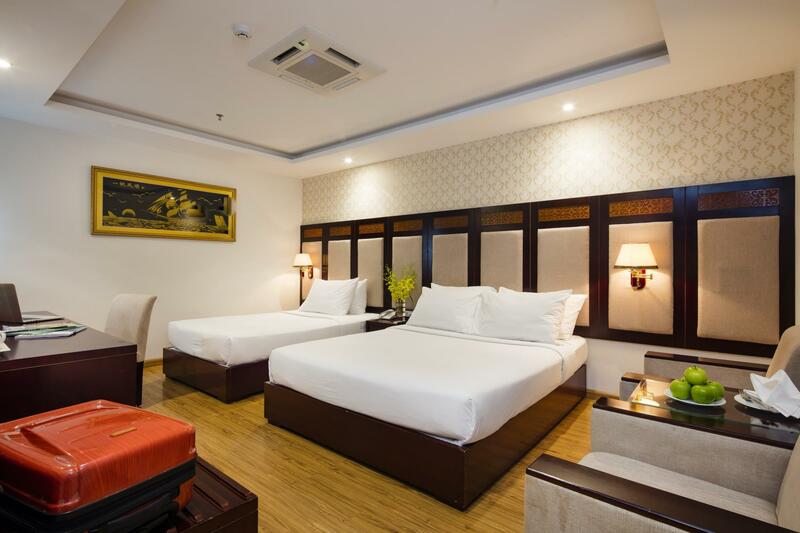 Het is een goed hotel voor zijn prijs en voor Vietnamese begrippen. Het ontbijt is zoals in bijna heel Vietnam. Vietnamees eten, toast en gebakken eieren. Er was wel stokbrood maar dat leek van de dag ervoor. Er was wel altijd genoeg lekker fruit. De kamers zijn niet zo groot maar van alle gemakken voorzien. Het is er schoon en er is me voor het eerst niks opgevallen wat stuk was. De bedden zijn prima. Het tweepersoonsbed is niet zo groot maar er stond nog een extra bedje bij. De airco was super in dit hotel. Vanaf het hotel loop je binnen 5 minuten naar een leuk strandje en restaurants en barretjes zitten in dezelfde straat. Wij hebben een nacht bijgeboekt omdat het ons beviel. 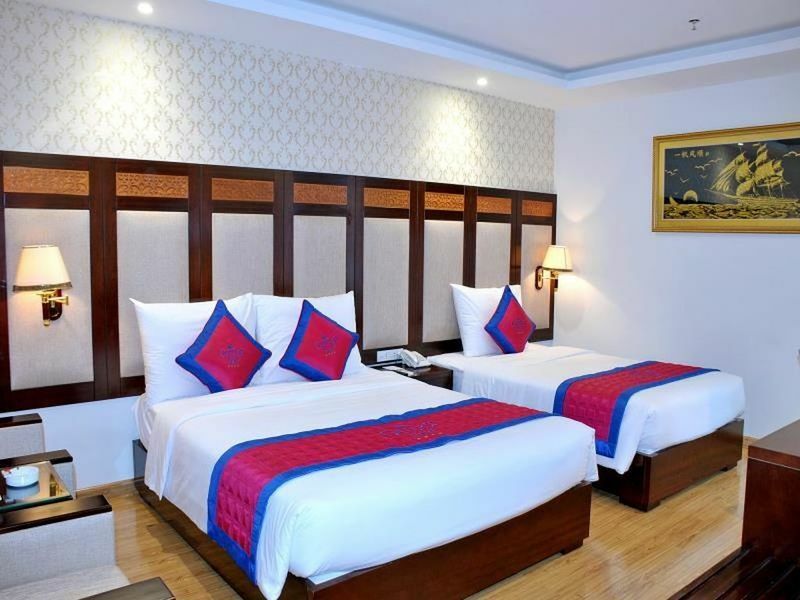 Walking distance to halal restaurant (Eden Fusion Restaurant, A&M Fast Food) and Viscon Mall. Got many spa and massage center around and happening street. 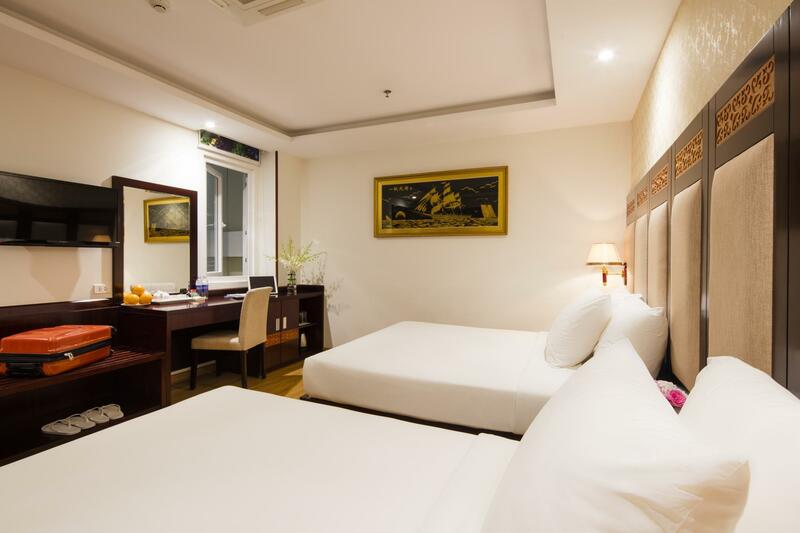 The staff was really helpful and the room is worth for us. We stayed there for 1 night and were completely happy with the room. This place is worth it. Staff are very friendly and helpful, clean facilities, great location, massage upstair are really good and legit. It would be great if they have air conditioning at the lobby. I would come back when visiting Nha Trang again. We have stayed only for one night and our experience at the hotel was ok. Staff is smiling but are not all over you, Hotel a little bit out dated as for 4 star property but still has all it needs. Beds are Ok and rooms are definitely quiet, at least the one we had. Bathrooms are spacious and we had a bath which was nice for a change as all of the properties had only showers :) A lot of space in the rooms and they are bright enough. We went to the pool on the roof which was not to the newest standards but definitely recommend to go if you have spare time. you can grab a beer or something else . 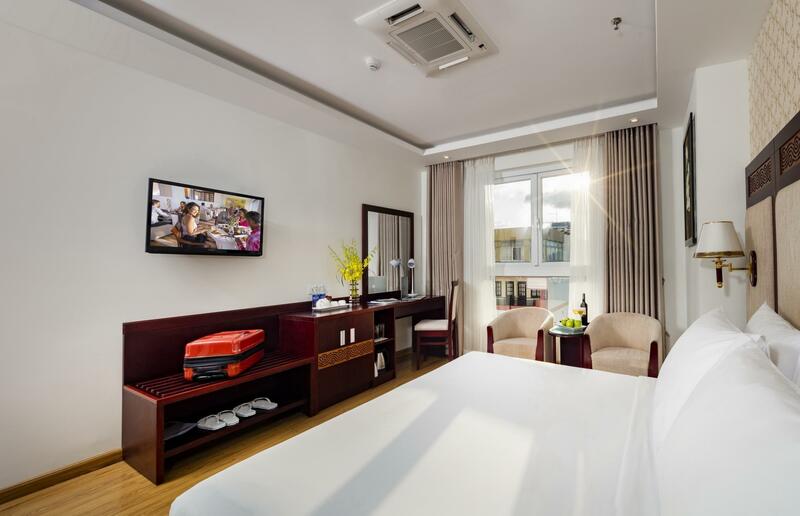 Location fantastic, the hotel is right in the centre of Nha Trang. It's close to the beach and all the main restaurants and bars. Rooms are really spacious, bed was huge, very comfortable. Cannot fault the staff, so friendly and helpful with everything. Rooms were also kept spotlessly clean. Breakfast had plenty of choice but did get very busy with noisy Chinese and Russians (the main tourists in Nha Trang). The hotel does have a gym which is adequately equipped but the air con didn't work and no water was provided which isn't really 4 star standard. Other than that I would highly recommend this hotel. I was very good in Galliot hotel. The staff is very professional kindly and also friendly and always smiling. Reception and tour desk help you for everythings!! The rooms and the bathroom are clean big and very beautifull. The hotel is close to the beach with restaurants shops spa and locals around. The price was very good for the quality of this hotel! I was so happy to stay in this hotel. Considered as a 4 stars hotel, the price was so cheap. The location is near to the beach, restaurants, and cafes. 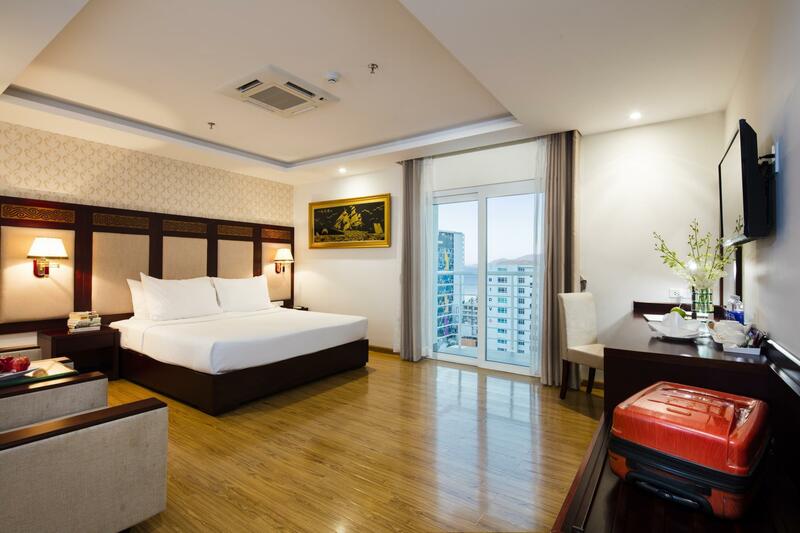 Definitely one of the best options to stay in Nha Trang. We stayed one night in the Galiot. And we have had great moment. Two hundred metres to the beach which is very beautiful. Restaurants are near by, and very convinient. We wish to return to this place again and again. We had many rooms booked here and 2 rooms weren't what we paid for but reception fixed it up. We all ended up very happy here. The staff liked us being friendly Australians and smile and say hi to everyone. I think they get a little tired of Russian visitors that don't seem to smile or acknowledge anyone including themselves but never rude to us. We would go back. Enjoyed our stay, would stay again and the location was good, only a couple of blocks to the beach and great restaurant's around and especially the Lanterns restaurant across the road was excellent, with great food and service. Roof top bar was great at the hotel and very reasonable prices. would stay again. 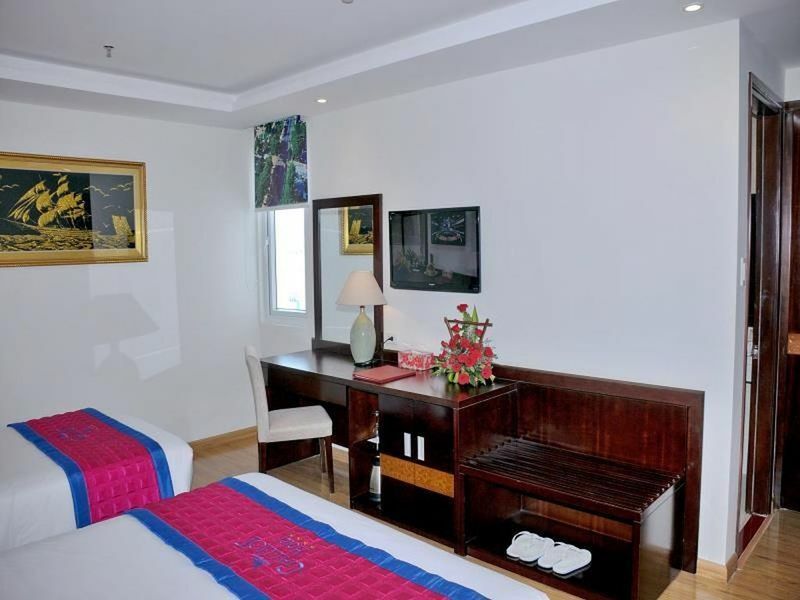 This is a recent hotel, furnished to a nice standard and offering good value for money. It is well located, less than 10 minutes from the beach and amongst the popular restaurants. Like all hotels in Vietnam it has a small footprint but the hotel make good use of the space at the rooftop pool and provide more loungers than most hotels. Breakfast was of a good standard every day and we enjoyed trying the local dishes as well as the typical western choices. The staff were cheerful and pleasant to deal with. We had 5 rooms for the whole family. Everyone had a great time. The hotel is about 5 min walk from the beach. The pool is big. There were lots of selections for the breakfast and choices for everyone from young to old. We were able to park our car for free. The gym/fitness center is small. keep a very close watch on traffic you must be looking 360 degreese all of the time while crossing the road because traffic comes at you from every possible angle all of the time day & night. but having said that it was enjoyable walking around soaking up the warm friendly local atmosphere. Good location with walking access to beach and restaurants. Rooftop pool had a good view of Nha Trang, but not of the sea. The free breakfast was reasonable and had a mix of Asian and Western cuisine. Hotel clientele appear to be a Russian plurality. Staff were nice and spoke fair English. "Standard No Window" room was clean, unassuming, and spacious enough for two people. Pleasant stay overall. Location is good and staffs are helpful and friendly. Breakfast for me was good too, not as bad as other reviews said. The only unsatisfied thing during our stay was the spa service, we paid for 3-hour Vietnamese beauty spa that consist of body massage, facial care and body scrub. It’s written clearly in the brochure that the price includes bossy massage, facial care and body scrub. But in the end only got 2-hour plus for body massage and facial care only. When we asked for the body scrub, the staffs in spa couldn’t communicate in English and insisted they had done the scrub. Then we called the front desk and talked to the receptionist and in the end we got refunded with VND10,000 only. If we knew that the price we paid was only for 2-hour body massage and facial care then we would not have chosen to do the spa in the hotel. We were really impressed with the hotel, but mostly by how friendly, accommodating, and professional the staff was. They immediately and efficiently handled everything we asked for with a smile.